According to the Global Burden of Skin Disease, skin conditions were ranked fourth in leading causes of disability, globally, and was the 18th leading cause of DALYs (disability-adjusted life year). Another serious condition sweeping nations is melanoma, a type of skin cancer affecting more than 85,000 individuals per year in the US alone. Recently, at Indiana University’s Medical School, scientists have found a way to develop skin organoids with hair follicles from pluripotent stem cells that could, in the future, provide new therapies and treatments for disorders and cancers of the skin. CRISPR gene editing technology was used to produce stem cells and the labeled cells were later analyzed to show organoids with sensory cells with the ears’ functions. Lee et al. show that hair follicles can be generated from mouse pluripotent stem cells in a 3D cell culture system. The hair follicles (red) grow radially out of spherical skin organoids and contain follicle-initiating dermal papilla cells (green cells) and hair shafts (cyan). Artwork by Jiyoon Lee and Karl R. Koehler. The current study was based on a similar concept. The scientists led by Dr. Koehler formed epidermal cells and watched it organize into clusters called skin ‘organoids’ where the outer layer of the skin faced the interior. After culturing it under optimal conditions for about 20 days, follicles of hair started to develop and grow in all directions. Stanford University’s Otolaryngology department confirmed that the hair and skin proteins matched that of the development in the mouse embryo, and a similar technique was possible with other mouse strains too. Using the organoids, experts are hoping to someday use human pluripotent stem cells which could lead to development of new skin grafting methods, therapies for advanced skin diseases and the evaluation of hair and its growth. With this study, what the researchers are most excited about is that if the basic building blocks of the skin cells can be cultured and formed this way, other cell types could also ‘self-assemble’ by themselves, and perform in a similar fashion. Top image: Lee et al. show that hair follicles can be generated from mouse pluripotent stem cells in a 3D cell culture system. 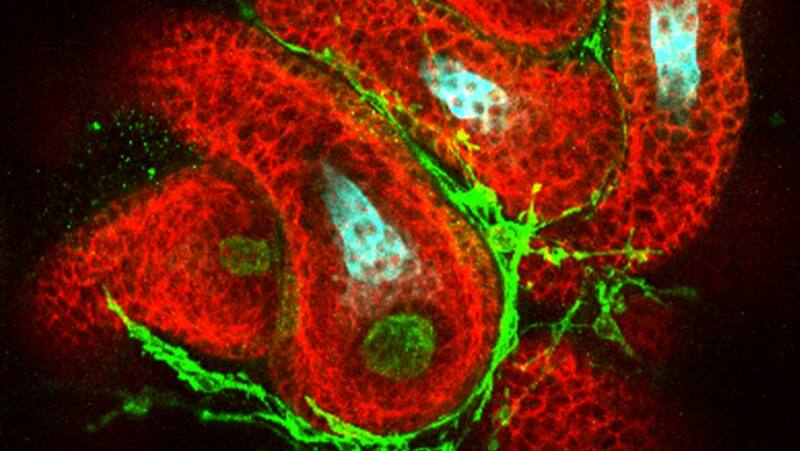 The hair follicles (red) grow radially out of spherical skin organoids and contain follicle-initiating dermal papilla cells (green cells) and hair shafts (cyan). Artwork by Jiyoon Lee and Karl R. Koehler.